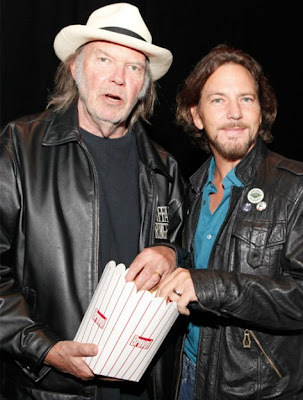 Ed and Uncle Neil at Toronto premiere of Neil's Jonathan Demme directed film "Neil Young Journeys" Sept 12th. Also, see Pearl Jam Joined by Neil Young for 'Rockin' in the Free World" Encore Last Night in Toronto. EV to NY: "Old man look at my life I'm a lot like you were"
I feel Neil's in better shape!? 'He stood with his popcorn, out lookin for good times'! that's Speakin' Out the truth chief.